Don’t you wish you could open your own letterhead or marketing documents in Word just like it was a pre-designed layout from Microsoft’s free template library? You can! 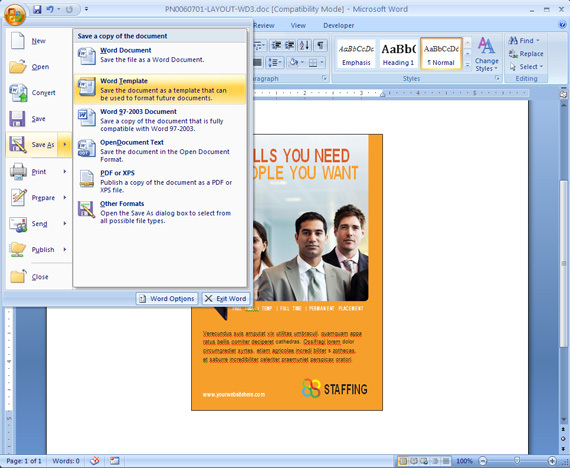 A document saved as a Microsoft Word Template creates a copy of the original with each new use. This makes creating new projects convenient and you’ll never overwrite your original document. In the example below, I will show you how to save a StockLayouts flyer layout as a Word Template for future use. 1. Open or create your marketing piece. 2. Edit the design to your company’s specifications. 3. Click the Microsoft Office Button, and then click Save As > Word Template. On a computer that is running Windows Vista, under Favorite Links, click Templates. On a computer that is running Windows XP, under Save in, click Trusted Templates. 5. Give the new template a file name, select Word Template in the Save as type list, and then click Save. In the New Document dialog box click New from Existing under Templates. Navigate to your design and click Create new. 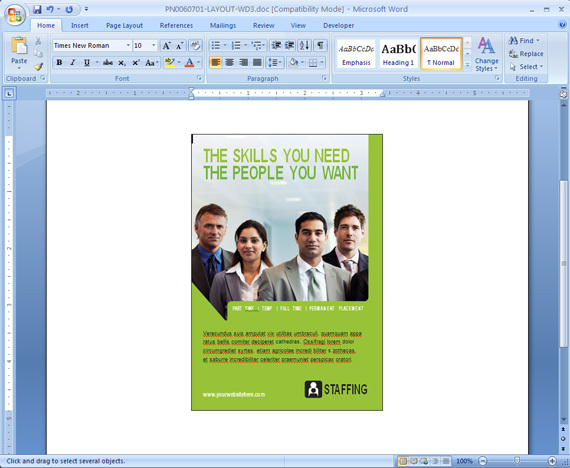 For more details about saving Microsoft Word Templates visit the Microsoft help guide. View MS Word document templates from LayoutReady.com. Try our free design templates to see how easy they are to customize.